The theory of evidence (also known as ‘evidential reasoning’, ‘belief theory’ or ‘Dempster-Shafer theory’) is, perhaps, one of the most successful frameworks for uncertainty modelling, and arguably the most straightforward and intuitive approach to a generalized probability theory. 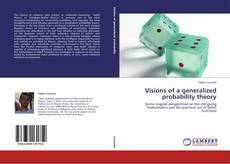 Emerging in the late Sixties from a profound criticism of the more classical Bayesian theory of inference and modelling of uncertainty, evidential reasoning has stimulated in the last four decades an extensive discussion on the epistemic nature of both subjective ‘degrees of beliefs’ and frequentist ‘chances’. Computer vision is a fast growing discipline whose ambitious goal is to equip machines with the intelligent visual skills humans and animals are provided by Nature, allowing them to interact effortlessly with complex and inherently uncertain environments. This Book shows how the fruitful interaction of computer vision and belief calculus is capable of stimulating significant advances in both fields. Novel results on the mathematics of belief functions are developed in response to the issues posed by fundamental vision problems to which, in turn, novel evidential solutions are proposed.